Another one-pot wonder coming in hot! You know I love my one pot meals, as I explained here, I tend to be a very messy chef so it definitely helps cut down on the clean up after. And this was even before I got my beloved Instant Pot! You can imagine I’m going one-pot meal crazy now. Anyways, back to the pasta. 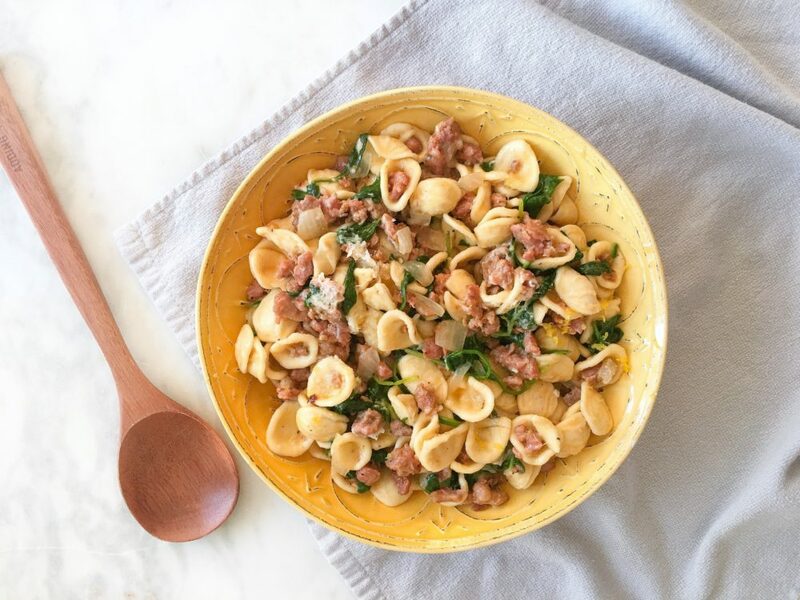 This was my first time using orecchiette pasta, I find the little shells so cute – although apparently their name is inspired by the fact that they look like little ears. Some people see little ears, I see the potential for a superb pasta dish! I love this dish because it’s super versatile in terms of ingredients. I’ve been using a lot of ground turkey and ground chicken lately, as a substitute for pork and beef in my meatballs, so I figure why not try the same for sausage. 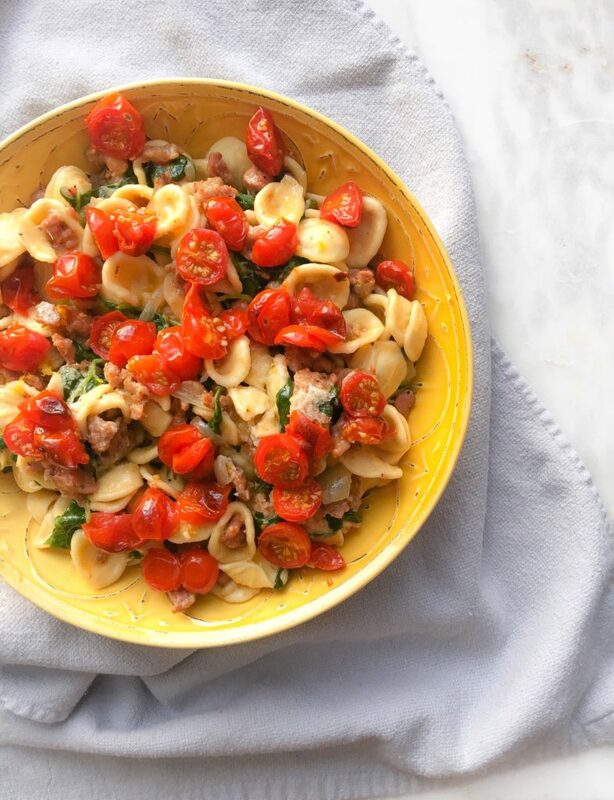 For this pasta I used turkey sausage but I think chicken sausage would work just as well. Another easy swap would be using broccolini instead of spinach. Whatever type of greens you prefer! I know what you are thinking ‘broccolini and pasta?’ But trust me the combo works! I also recommend this recipe if you haven’t tried it yet: Lemon, white bean & broccolini pasta. And finally, if tomatoes aren’t your thing, it works just as well without them! This is the perfect week night meal but I also love serving this dish for dinner parties. 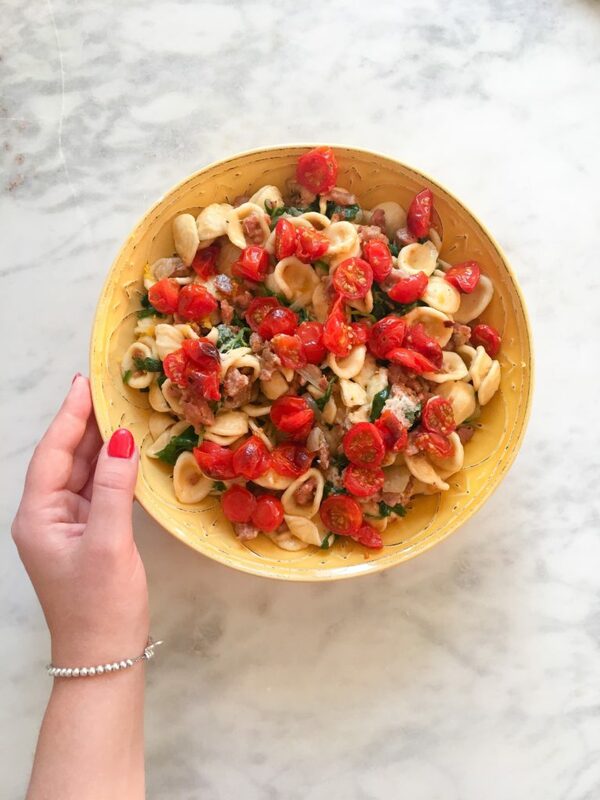 Pasta is easy to make in large batches and this one is definitely a crowd pleaser! To make the dish, start with a large pot, once heated add olive oil and start cooking the sausage. I like to remove it from the casing but you can also cook it whole and then slice into pieces. Once cooked, remove and set aside. Next add diced onion, cherry tomatoes halved, garlic and red pepper flakes. When the onions are translucent add the broth, and bring to a boil. Once it hits boiling point, add the pasta. 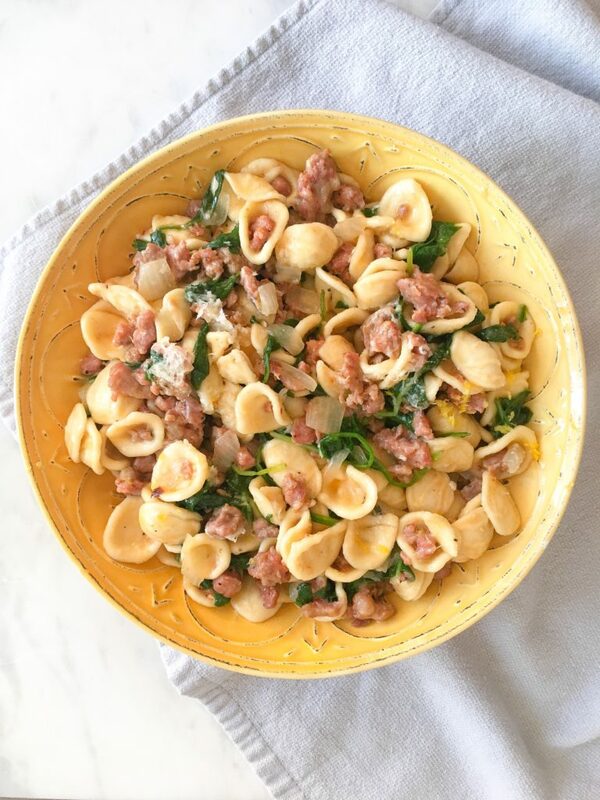 Cook for about 8-9 minutes, then add your spinach, sausage, lemon juice and Parmesan cheese. Top with extra Parmesan and lemon zest. What are you looking to make?